Container is a travelling exhibition designed for the Australian National Maritime Museum that aimed to go ‘beyond the conventional museum experience’ through a unique and engaging telling of the fascinating history, impact and future of the global shipping industry. Container is a free exhibition targeted to a broad audience including; families, knowledge and culture seekers, school groups and others. 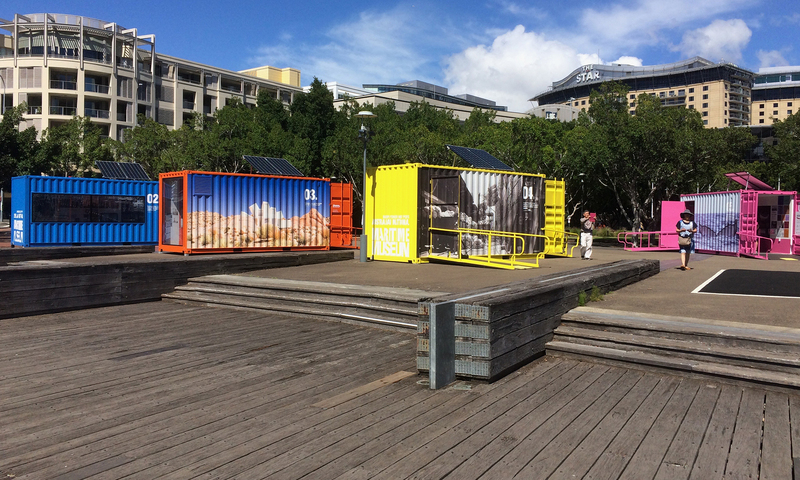 The exhibition is situated in six standard shipping containers located at two outdoor sites in Sydney; the forecourt of the Museum’s Wharf 7 administration building at Pyrmont; and the main entrance of the Museum building at Darling Harbour. The exhibition marked the 60th anniversary of the sailing of the first container ship service run on Pan-Atlantic’s Sea-Land service. Five of the six shipping container spaces contained engaging, interactive and lively walk-in exhibition spaces, presenting a range of stories and themes relating to the shipping industry and containerisation as well as their impact on our lives. Bold graphics, along with engaging objects and playful interactives, created a dramatic and memorable experience for the visitor, allowing for unique educational and entertaining experiences. A giant ‘showcase’ installation comprised the sixth container space, fitted out with a typical ‘room’ that illustrates the extent to which we rely on sea cargo in our day-to-day lives. The outdoor location of the exhibition was not appropriate for the display of museum objects and therefore objects utilised were representational and props. Many of these objects allowed people with visual disabilities opportunities (through tactility) to engage with the content and experience of the exhibition. The exhibition runs until October 2018 and will then travel to various sites across Australia. In addition, there is a potential international component within its 5-6 year lifespan.